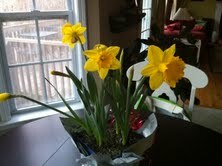 I LOVE DAFFODILS!!! I am not sure why, I don't particularly like the color yellow, but I have always loved the flower. I believe it is because it is one of the first signs of Spring and I am NOT a fan of Winter. I also think it is because you see them everywhere, on the side of road, old barns, and at old home sites. I know I shouldn't pick them all and allow others to enjoy their beauty but I pick all that I can and take vases full to work and place them all around my house in the Spring. I don't pick the ones in my yard :) I have to make emergency road side stops! And I frantically pick them in a hurry like I am committing a crime...I think I learned a Girl Scout motto once about leaving things as they are in nature and I have always wanted to pick flowers, I can't leave them. These were a Valentines gift from my Mema, they are blooming wide open now filling my kitchen with Spring.....What is your favorite flower? Favorite thing about Spring? I love Spring and the joy & flowers that it brings! My personal faves are tulips and lilies...but my little botanist/farmer/bug boy, he picks any type of flower no matter whose yard it is in and knows that giving flowers to a lady is special. I am saddened that the voles ate 125 bulbs that I planted last year. Not one emerged...anyone got any remedies for that? No advice for the voles, we have moles and they ate all my tulip bulbs too. But daffodil bulbs are poisonous for all animals, moles, voles, and deer leave alone!